Android has a bit of a reputation for being a malware hotspot, at least when it comes to mobile operating systems. It's far easier to get apps onto the Google Play shop than other app storefronts, which has allowed nefarious types to plant dodgy software all over it. That's before considering third-party app stores. Google as a result is stepping up its defenses. First announced at this year's I/O conference, it's now rolling out to the wider Android user base, looking to help secure user's devices. 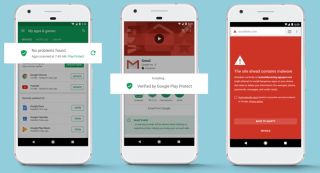 Google Play Protect will automatically scan apps installed from the official Google Play store to make sure they're not attempting to do anything dodgy with your devices. Using machine learning, it'll scan a billion devices a day for suspicious behaviors, leading to roughly 50 billion apps a day being scanned. Of course, there aren't 50 billion apps on the app store, so this figure includes multiple installations of the same app. But that makes sense – the same app on one device may not have been infected in the same way it was on another. The fact that Play Protect works automatically may be its greatest feature – those most likely to be hit by Android malware are those not even aware that it exists, so by making it a passive experience means the most vulnerable users won't have to do anything to shore up their defences. Rolling out now, it'll hit all devices running Google Mobile Services 11 and later in the coming days and weeks.